Allow the patient to resume breathing spontaneously, making sure that muscle relaxation is completely reversed and anti-emetic medication has been given. Deep extubation is most easily done with inhalation anesthesia and minimal narcotic use. Do not reduce the amount of inhaled anesthetic toward the end of the case. Make sure that tidal volume is adequate, and that the respiratory rate is less than 25. If the patient is breathing rapidly, titrate small amounts of a long-acting IV opioid (hydromorphone, morphine) until the respiratory rate settles down. Insert an appropriately sized oral airway, and use a suction catheter to suction down the center of the airway and beside it on each side. Secretions are the enemy. If the patient reacts at all to suctioning, he or she is not deeply enough asleep. Titrate small amounts of IV opioid or propofol, and/or give 1 mg/kg IV lidocaine. Suction again; confirm that the level of anesthesia is deep and that the patient does not react but is still breathing well. Deflate the cuff and remove the tube. Discontinue the inhaled anesthetic. My preference is to have the patient breathe supplemental oxygen via a transport face mask rather than to use the anesthesia circuit and mask, because there is no need for further inhaled anesthesia. Turn the patient’s face slightly to one side and gently lift the chin and/or mandible. Make sure that the patient is exchanging air well. It is not uncommon for the patient to hold his/her breath momentarily just after extubation, but breathing will resume, I promise. There is no need to intervene. Continue to support the chin or mandible until the patient is able to maintain a patent airway without assistance. Remove the oral airway as soon as the patient begins to react to it, to avoid biting or gagging. With improper patient selection, it certainly could be. This is not the technique for the patient with a full stomach, ileus, GI obstruction, achalasia, a BMI of 70, or a reason why you might choose to intubate awake. It is appropriate for most patients who walk into the hospital breathing room air, are scheduled for elective surgery, have fasted, are not morbidly obese, and are not chronic CO2 retainers. If your plan is to induce anesthesia and mask ventilate prior to intubation, it is likely that deep extubation will be safe and feasible. What if the patient goes into “Stage 2” on the way from the OR to PACU? This question reflects a misunderstanding of the definition of “Stage 2” anesthesia. The stages of mask induction with diethyl ether anesthesia were described by Dr. Arthur Guedel in a 1920 article, and later in a 1937 textbook. He characterized “Stage 2” as the “delirium” stage, with rapid eyeball activity, swallowing, and possible vomiting. We no longer use diethyl ether, and modern balanced anesthesia utilizes multiple different anesthetic medications for hypnosis, analgesia, and anti-emesis. There really is no “Stage 2” anesthesia, either on induction or emergence. Today “Stage 2”, in my opinion, has become a tale handed down by attending anesthesiologists from generation to generation to frighten the children and justify the unpleasantness of awake extubation. Occasionally patients may exhibit signs of excitement on emergence. This occurs more often with younger patients, but may happen at any age. 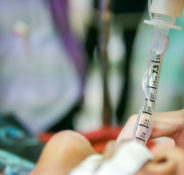 If the patient should move unpredictably, and isn’t awake enough yet to cooperate, a small dose of IV propofol will calm the patient and this phase will pass. For this reason, the prudent anesthesiologist will always have propofol in his/her pocket during any patient transport. Emergence delirium and postoperative cognitive dysfunction are genuine medical problems, but are not related to the timing of extubation. What about the risk of laryngospasm? This is one of the old wives’ tales of anesthesiology. A patient may experience laryngospasm for multiple reasons, not solely as a response to extubation during “Stage 2”. Laryngospasm can happen in awake patients due to GE reflux or reactive airways disease, or upon induction of anesthesia in adults or children. It has occurred in the PACU. I was called into an operating room one day to assist in the care of a patient who had gone into laryngospasm at the end of her procedure, sitting bolt upright on the gurney, desperately trying to breathe but as blue as a Smurf. Awake extubation is no guarantee of immunity from laryngospasm. There is a tendency to confuse inspiratory stridor with true laryngospasm. Inspiratory stridor may occur briefly after extubation, and may be relieved by elevating the mandible and opening the airway. Administration of 0.5-1 mg/kg IV lidocaine may help as well. As the patient continues to emerge from anesthesia, inspiratory stridor will resolve on its own. True laryngospasm is characterized by the complete absence of air movement or sound despite vigorous attempts to breathe. Obstruction of the airway occurs at the level of the true vocal cords, the false cords, and the redundant supraglottic tissue. This creates a ball-valve obstruction, controlled by the intrinsic and extrinsic laryngeal muscles. Applying positive pressure will not relieve true laryngospasm, and may worsen it, because it will press the aryepiglottic folds more firmly against each other and reinforce the closure. This phenomenon was described elegantly by Dr. Bernard Fink in his classic article published in Anesthesiology in 1956, “The Etiology and Treatment of Laryngeal Spasm”, and reiterated more recently in a letter to the editor. The persistence of many anesthesiologists in believing after more than 50 years that positive pressure will “break” complete laryngospasm confirms my impression that the principles of “evidence-based medicine” are applied or ignored selectively if they challenge entrenched belief systems. How should complete laryngospasm be managed? If a patient at any stage of care is in true laryngospasm, characterized by attempts to breathe with no sound, no air movement, no chest rise, and a visible tracheal tug, positive pressure ventilation will be useless. The first step is to elevate the mandible and apply firm upward pressure just behind and above the angle of the jaw — the so-called “laryngospasm notch“. (Click here to watch a NEJM video of this technique, known as the Larson maneuver.) Watch to see if air movement resumes. If this maneuver does not work within a breath or two, however, the next step is to make the patient apneic. If the patient continues to try to breathe against a closed glottis, there is a risk that the patient will develop negative pressure pulmonary edema. This will cause no end of problems, including an extremely expensive cardiac work-up, extended hospitalization, and potential lawsuit. Apnea may be achieved with enough propofol, or with a small amount of any muscle relaxant. Succinylcholine is the classic treatment; even 10 mg IV will suffice, but make sure the patient is asleep first. Assure adequate oxygenation with mask ventilation, suction any secretions, and then permit the patient to resume spontaneous ventilation and wake up. It isn’t always necessary to reintubate. Laryngospasm should be neither life-threatening to the patient, nor terrifying to the anesthesiologist, if the pathophysiology and treatment are clearly understood and the right plan of care is promptly initiated. Why bother with deep extubation when awake is easier? There are many surgical situations where deep extubation is desirable: hernia repair, thyroidectomy, plastic surgery procedures, any major abdominal procedure where coughing will strain the repair, ophthalmology procedures, cervical spine surgery — the list goes on. With today’s modern insoluble anesthetics, emergence from anesthesia is rapid and outpatient discharge need not be delayed. Deep extubation is a useful technique for any anesthesiologist to master, and it is a key part of the art as well as the science of anesthesiology. Deep extubation can be accomplished smoothly with other anesthetic medications as well: propofol, dexmedetomidine, etc. The basic principles are the same. Make sure the patient is breathing well and not reacting to the ETT. I’ve simply given one recipe; I’m sure other “chefs” have their own. Positive pressure assisted ventilation can be used to treat inspiratory stridor during emergence, but care must be taken not to push any secretions down toward the vocal cords, or you could turn inspiratory stridor into true laryngospasm. My preference is to treat inspiratory stridor with IV lidocaine, perhaps a little IV narcotic, and airway support, and simply wait for it to go away on its own. Couldn’t agree more on the elegance of deep extubation. Thank you for eloquently dispensing with the dogma that surrounds this issue. Typing one handed here so please forgive typos. Deep extubation is a favourite discussion point as it often comes up as a solution to oral exam questions. What is interesting is that in the 9 years I’ve been discussing it, I’ve never had a single trainee who had either seen a deep extubation or was capable of defining it (I’m excluding paediatric extubations on TIVA which is a different beast). ‘Deep extubation reduces the incidence of coughing, bucking and the haemodynamic effects of tracheal tube movement, but these advantages are offset by an increased incidence of upper airway obstruction [95–97]. This is an advanced technique, which should be reserved for patients in whom airway management would be easy and who are not at increased risk of aspiration.’ The Bailey manoeuvre also is mentioned briefly. Delving deeper into the historic data yields the studies that resulted in the recommendation of >1.5 MAC. When I tried to navigate the old data, I was forced to come to the same conclusions. it’s an advanced technique that needs to be taught by those with significant experience, practiced regularly and only used on appropriate patients. I am glad you continue to use it to great success and I hope you teach others. My local experience reflects that at Stanford when they did their informal poll in 2013 and found that the number of deep extubations approached zero. (https://theanesthesiaconsultant.com/2013/09/16/landing-the-anesthesia-plane-when-should-you-extubate-the-trachea/). No one really exists to teach the technique in my region and so, to the best of my knowledge, it has all but died. We’ll extubate on remi infusions and rarely convert to tiva and do a deeper extubation that way. Beyond that, barring some providers at some our sites who trained elsewhere and may have some patterns of practice i’m not aware of yet, I don’t believe its happening here. Thank you sincerely for sharing this as it provides a modern context for what was only a historic interest. Great piece, Dr. Sibert! Although I rarely have patients who are candidates for deep extubation, this is a great reminder to keep it in my practice. Thank you for confirming, codifying,and enlightening me simultaneously on the aspects of a technique I find incredibly useful. I will definitely bookmark and share your post! Does anyone not prefer a smooth emergence? 16th year in practice. i rarely deep extubate because IT is more work and takes longer. 1) You state that Stage 2 doesnt exist when using modern drugs and not ether. I say Nonsense. We most certainly see this on almost every emergence.. period of excitement… and the answer in my opinion is NEVER to give more propofol. The answer is let them emerge further until they traverse this “stage 2 ” period of excitement. Again, I’m not saying there’s no such thing as a brief excitement phase, particularly in younger patients but sometimes in older ones as well. However, a little propofol works just fine while they breathe off a little more of the inhaled agent. I don’t like risking having the patient pull out an IV accidentally if they’re moving. My point is that “Stage 2” is a very specific definition in relation to ether anesthesia in the absence of all IV medications, associated with rapid eye movement and other characteristics including vomiting. We just don’t see that today. Greetings from Mexico, in my hospital, we commonly observe this technique of extubation, with pleasure I read that in other countries, I have seen that some anesthesiologists with great skill and in the indicated patient extubated them even without ventilation, and extubation is excellent, it should be studied more this matter. By the way, there are very few places to consult this, will you know of another? No, I don’t really know of much that has been published on this topic. That’s why I decided to write down my approach to deep extubation. There are other ways to perform deep extubation: you can do it with propofol, dexmedetomidine, whatever. I use inhaled anesthetics (desflurane, sevoflurane) commonly in my practice as I do a lot of thoracic and general cases. For neurosurgery cases with evoked potential monitoring, obviously deep inhaled anesthesia is not a good option. Your technique sounds perfectly reasonable to me, and I’ve been doing it similarly for more than 35 years. I don’t think I can agree with you, but thank you for taking the time to read and comment! Too classy in your response above, Dr. Sibert. I liked reading your perspectives as well as the doc over at anesthesia consultant, who prefers not to do deep extubations. As trainees its easy to “memorize” which attending “likes” what and make our supervisors happy, but in doing that we are wasting our own time. The key is to learn the pros and cons of each attending’s method, take the time to read and ponder on them, and one day (hopefully!) choose our own. Of course as a trainee it is also frustrating when the attending doesn’t have the time to give me an explanation- don’t they realize how much I can learn from just a few small words of explanation?! That said, I’m stuck in the same room all day and they are running between two, so I’m sure they have their reasons. Nice article. I do occasionally do deep extubations and follow a similar procedure as you describe. One thing I do routinely is give a small dose of propofol before the extubation because this seems to reduce the incidence of coughin during the extubation and I also provide CPAP with the anesthesia breathing system to prevent airway obstruction. I like to use the technique for pelvic laparoscopic procedures because I can extubate when the skin incision is almost closed and the anesthetic usually wears off by the time the legs come out of the stirrups. It is a technique that we should know how to do but I do agree that it is an advanced airway technique. At our institution trainees are taught from early on how to perform deep extubation. I extubate most of my patients in this way, excluding patients at risk for regurgitation of course. About half of our specialists practice deep extubation and the other half waking the patient up beforehand. It has not been observed that deep extubation causes more complications. This technique is also actively taught at the nearby university hospital. University hospitals in Finland are notoriously conservative. I think you write a nice description of deep extubation. I think it is most important to be able to do BOTH techniques well. This day in age, with the pharmacoagents we have, an anesthesiologist should be able to wake up a patient in the OR well without looking like a fish on a line. Some PACU coverage/vigilance issues may way in favor of awake extubation in ensuring the patient is packaged well before travel. One advantage of awake extubation is the titration of pain medication to ETCO2 before awakening (if the patient is comfortable they usually are not bucking as narcs/lidocaine have an antitussive effect when adequately titrated). Also, propofol/remifentinal combo is terrific for Thyroids, ENT, plastics — nearly no PONV with smooth emergence. Like anything in anesthesia, anything can be done well if you know what you are doing. Excellent topic of an usually underrated issue! Very useful for everyday practice. Thanks! Thank you for the article..I just succesfully extubated my patient with poorly controlled asthma by using this technique. A Very smooth emergence achieved. Wonderful review of the elegance of deep extubation. I have been utilizing this approach for all my patients (I work in an outpatient ENT surgery center) except the rare exception as explained in your article. My aha moment was early in my career (25 years ago)when I performed a deep extubation on a patient with severe asthma (as the textbooks implored us to do). When I saw how smoothly this patient emerged from anesthesia I wondered why we reserve this technique for such a small number of our patients. I cringe when I hear about others who demand their patients emerge from anesthesia coughing and thrashing on an endotracheal tube. This is not without consequence. I use this technique more often than not, in pediatric patients. Done well, it is not only smoother, but much faster. How interesting is his story because he takes us by the hand with the imagination of a real situation, however I can mention him with regard to the extubation of the awake patient, it will not necessarily be as traumatic as he refers and effectively depends on performing the anesthesia based on evidences; even with halogenated I can mention that extubation to the awake patient is possible without coughing and can sevoflune or desflurane but that depends on the technique and to control all the variables that could prevent it; using TIVA would be the best alternative and the adjuvants will be a marvel and the awake patient could withdraw the orotracheal tube with his own hand and laryngospasm could become anecdotal only because its possibility will decrease. How passionate it is to write about Anesthesia, I share your passion. With absolute respect, thank you.